Peter Mayhew, the legendary actor who portrayed the fan-favorite Wookie Chewbacca in the Star Wars franchise for almost 40 years until his retirement after The Force Awakens, will be headed to the franchise’s celebration in Chicago this year, according to the official Star Wars website. In addition to Mayhew, the festival has also added a slew of big names including Donald Faison, who voices Hype Fazon on Star Wars Resistance, Jason Isaacs, who voices the Grand Inquisitor on Star Wars Rebels, Vanessa Marshall, the voice of Hera Syndulla on Rebels, Myrna Vellasco, the voice of Torra Doza on Resistance, Michael Pennington, who portrayed Moff Jerjerrod in Attack of the Clones, Tom Kane and Catherine Taber, who both voiced numerous characters in Star Wars: The Clone Wars, and Dee Bradley Baker, who lent his voice to numerous characters on The Clone Wars, Rebels and Resistance, and Temuera Morrison, who portrayed Jango Fett and Commander Cody in Attack of the Clones and Revenge of the Sith. Joonas Suotamo, who portrayed Chewbacca in Solo: A Star Wars Story, The Force Awakens, The Last Jedi, and more, will be at the Star Wars Celebration along with Sam Witwer, the voice of Maul in The Clone Wars, Rebels, and played the other half of the horn-headed Zabrak to Ray Park’s performance in Solo. The actors will be at the Topps autograph area during the event. Greg Grunberg (The Force Awakens) will also appear alongside puppeteer Dave Chapman, Greg Proops (Resistance, The Phantom Menace), Paul Kasey (Rogue One: A Star Wars Story, The Force Awakens), Ian McElhinney (Rogue One), and Orli Shoshan (Attack of the Clones, Revenge of the Sith). 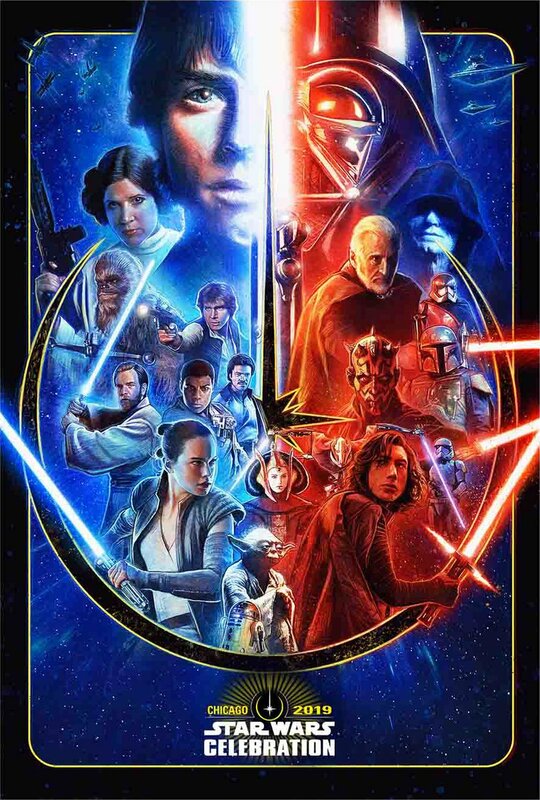 The poster below is a symbol of the ancient Jedi Order striking a balance between the light and the dark. The art is a saga-sweeping design featuring some fan-favorite heroes and villains. To check out more art, visit Artist Alley at the event, which will be home to familiar and new creators this year, including: Malcolm Tween, Darren Tan, Jason Christman, Zoltan Simon, Joey Spiotto, Brian Miller, Matt Busch, Chris Trevas, Karen Hallion, Adrianna Vanderstelt, Danny Haas, Jason Palmer, Spencer Brinkerhoff, Kaela Croft, Brandon Kenney, Russel Walks, Dianne Harrop, Kayla Woodside, Alex Buechel, Cryssy Chung, Steve Anderson, Brian DeGuire, Chris Dee, Michael Pasquale, Cat Staggs, Jerry Vanderstelt, and Brian Rood. Star Wars Celebration is an exciting convention filled with entertainment, celebrity appearances, stage shows, panels, interactive events, exclusive merchandise, screenings, and once-in-a-lifetime glimpses into the future of the epic saga. More details, including guests and events for the 20th-Anniversary celebration, will be available soon on the Star Wars Celebration website. The event is produced by Lucasfilm in collaboration with ReedPOP. RELATED: Star Wars Celebration Heads to Chicago in April 2019! If you are purchasing your tickets on or before the ticket mailing deadline on February 27, 2019, your tickets will be mailed via USPS to the address you enter. International orders will have the option to have tickets mailed or picked up at Will Call. If you order 5 or more tickets, please note that UPS shipping will be automatically added to your order to ensure delivery. If you purchase your ticket after the ticket mailing deadline, you will have to wait in line at Will Call to pick up your tickets. 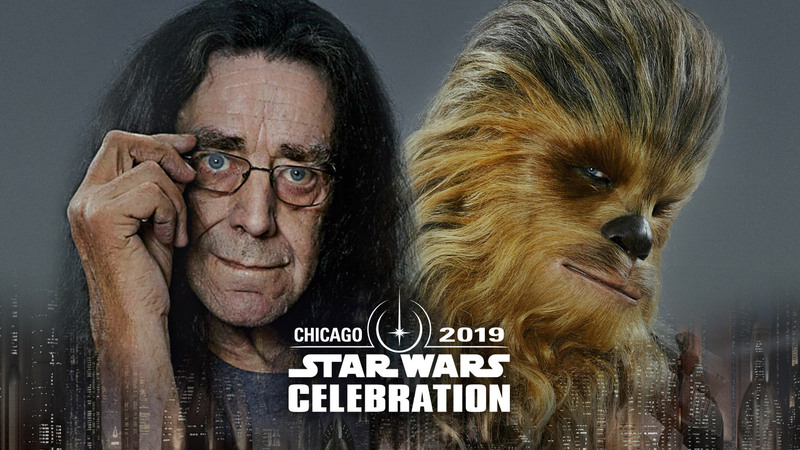 The post Peter Mayhew Headed To Star Wars Celebration Chicago appeared first on ComingSoon.net.